In the Table of Contents for the book you are working on, click on the title of the chapter you want to edit, or on the Edit Chapter button that appears when you move your mouse pointer over it. You can also access chapters from the Word document uploading interface (see Importing Word Documents into Booktype). 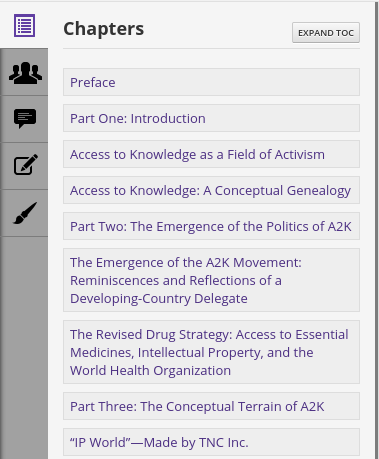 The Chapter editor opens, showing the chapter title and any text that has already been added. Since Booktype is web-based, you can use your web browser's zoom function to find an on-screen text size that suits you. The size of the text in the published book is not affected. Here, for example, is how Booktype's chapter editor might look in a maximised browser window on a typical contemporary monitor (1920 pixels wide) at your web browser's default zoom level (100%). As you can see, on a large monitor most people will be better of using their browser to zoom the on-screen text. Adjusting the zoom level is quick and easy if you use the standard keyboard shortcut combination of the Control key and the + (plus) key to zoom in, and Control and - (minus) to zoom out. As we've seen, Booktype's chapter editor is very reminiscent of a simple word processor, so you won't be surprised to see that at the top of the page is an editing toolbar, featuring a familiar set of tools. There are icons for undo; a styles menu; icons for bold, italic and underline; for creating links (internal and external); bullets and numbering; and inserting non-breaking spaces. Moving your pointer over a toolbar icon will pop up a tooltip to explain its function. Most of these are self-explanatory, but let's have a quick look at one of them. 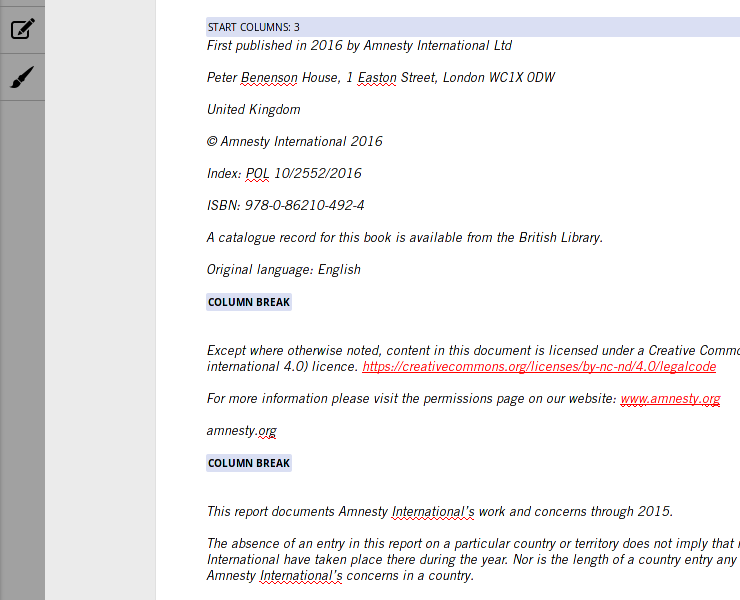 If there is some text in the chapter which you would like to convert into a web link, such as a document reference on the amnesty.org website, select the text and then click the Insert Link icon in the toolbar. To add linked text, you can also put your cursor at the point where you want to insert a link, and click the same Insert Link icon. In the first field, enter the URL of the web page you'd like to link to. If you selected some text before you clicked Insert Link, this will appear in the second field. You can adjust it if you like. If you didn't select any text, enter some here now. Then click Insert Link. The link will appear in your text, underlined and in a red font. In Screen PDF output, links and endnote references appear in a blue font. Select some text or place the cursor at the appropriate point in the text, and then click Insert comment to open the Comment box. Type in the comment for your fellow editors and click the Insert Comment button to close the box. 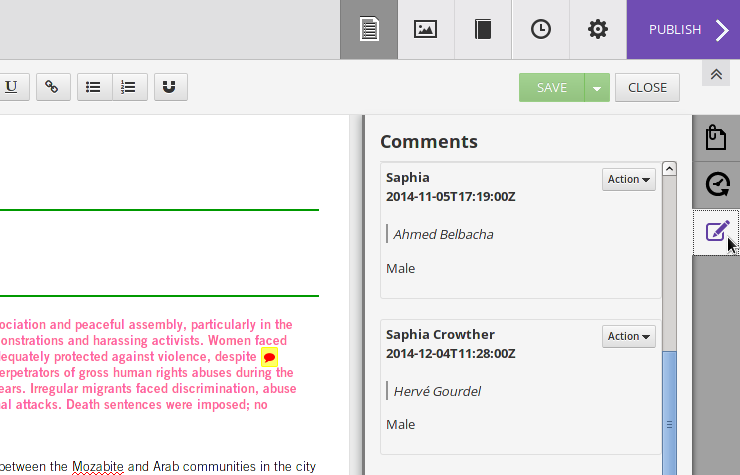 The comment will now be available in the Comments sidebar on the right side of the editor, and a red speech bubble icon will indicate the position of the comment reference, which is the position of your cursor at the time you inserted it. Comments without selected text should not be placed within words, or between words and punctuation, as this will make extra spaces appear in the output at the position of the comment icon. If you do not wish to select any text, it is better to place the cursor after the relevant word and any punctuation, such as a full stop or comma. This will appear as an ordinary space in the output. Clicking Insert endnote in the Insert menu will take you to the end of the chapter. 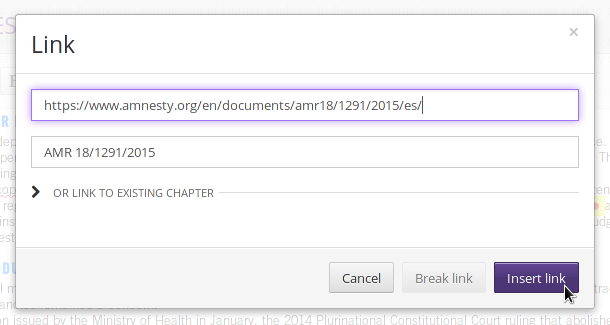 Type your endnote text and it will be inserted automatically. A superscript number for the endnote is inserted where your cursor originally was. The Insert columns and Insert column break options are used for special layouts, such as the Imprint page, where the number of columns changes within the page. You do not need to use these for most chapters, which will be formatted into columns automatically at the Publish stage. 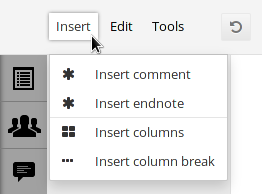 All chapters are displayed in the editor as a single column, to make them easier to work with. 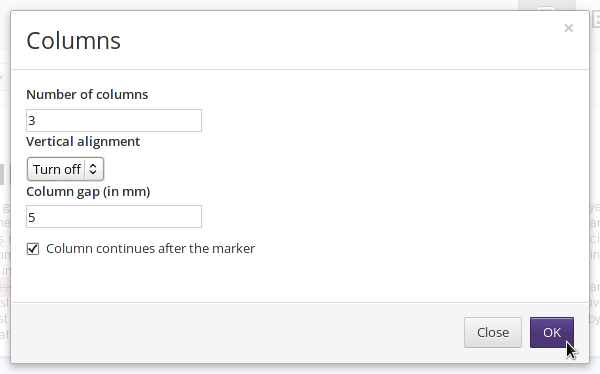 Clicking Insert columns will open a pop-up enabling you set the Number of columns and the Column gap (in mm). For the Imprint page, this should be 3 columns and a 5mm gap. Vertical alignment should be turned off but the box Column continues after the marker should be checked. In the chapter text, use Insert column break to divide the columns where you wish. Like the column start marker, the column breaks will appear higlighted in pale blue in the editor. Column breaks can also be used to prevent a heading or subheading appearing at the end of a column, or breaking over the column end. When text is separated from the heading or paragraph it belongs to, these lines are known as 'widows and orphans' in typesetting terminology. Please note that manually inserted column breaks can have an effect on subsequent pages, so it is important to check the PDF output carefully after inserting one. 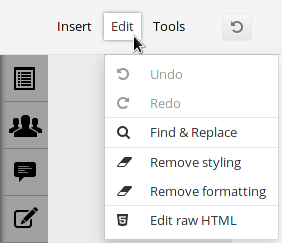 The Edit menu contains the following features: Undo; Redo; Find & Replace; Remove styling; Remove formatting; and Edit raw HTML. 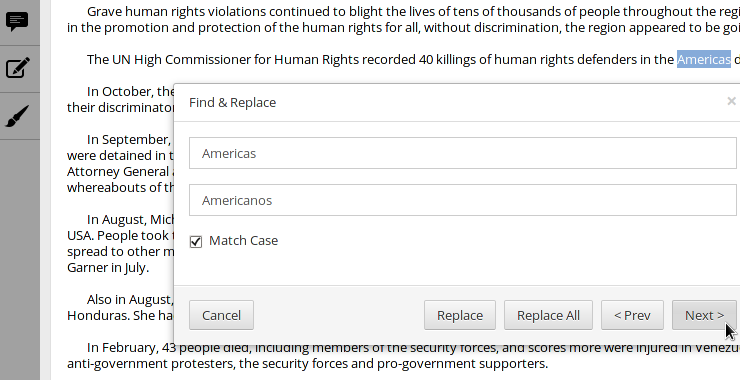 The Find & Replace feature opens a pop-up window with < Prev and Next > buttons which enable you to review the found words. 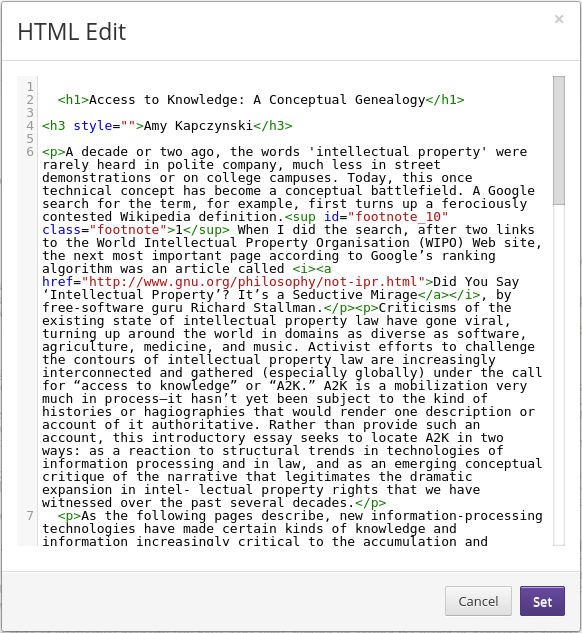 A note on the Edit raw HTML feature: Being built for the Web, Booktype's internal format is HTML. So it's easy for someone who knows a little HTML to edit the underlying file directly. Usually you won't need to do this. But if there's a little glitch that you can't fix in the chapter editor, you can use this menu option to bring up the HTML Edit window, in which you can make any required edits to the HTML and click the Set button when finished. Endnotes have a special editing interface to make sure they are formatted correctly. 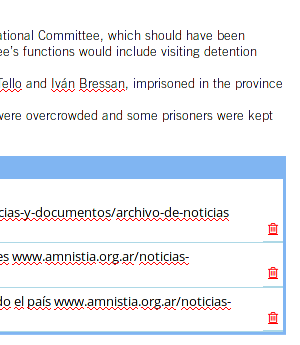 Endnote references, if present, can be seen highlighted in a red font in the body text. Click on the endnote at the lower end of the page to edit it. The endnotes will then be surrounded by a light blue box to show that they are separate from the main text. Endnotes can be deleted by clicking on one of the red trashcan icons on the right side of the box. 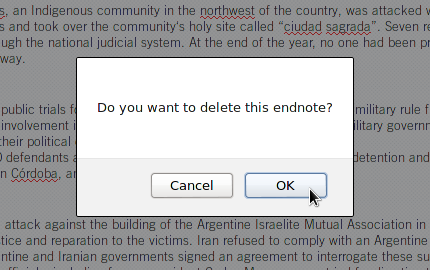 You will be prompted to make sure you really want to delete the endnote. Save minor change : this will save your changes but will prevent a new revision from being recorded in the Book History. 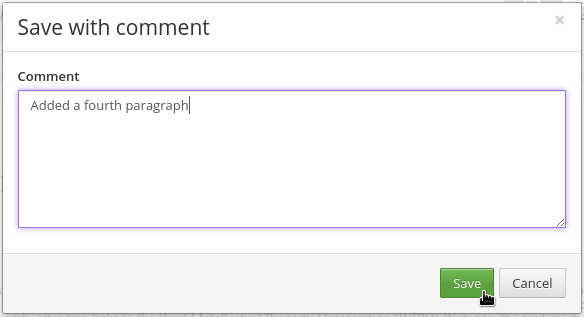 Save with comment : this will bring up a window in which you can type a comment to accompany your saved changes. This is the recommended practice, because comments can help you keep track of what you have done and let your fellow contributors know about the changes you have made to the book. The adjustment controls in this tab, which has a paintbrush icon, are not available on the Amnesty server because the styles are fixed. The tabs on the right side of the chapter editor, from top to bottom, are Attachments, History and Comments. The Attachments and History tabs are not used in the Annual Report. To compare revisions, use the Book History button in the main toolbar instead. The Comments tab, which has a pen and paper icon, lists all the comments on the original Word document that was imported into Booktype. Clicking on a red and yellow speech bubble icon in the text will highlight the matching comment in the sidebar, by changing the comment's background from grey to white. Depending on your computer and web browser, you might have to single click or double-click on the speech bubble to make this work. 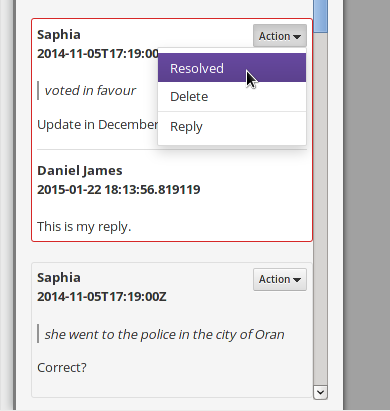 In Booktype, comments can be replied to, marked as resolved, or deleted, using the Action drop-down menu on the right side of each comment. 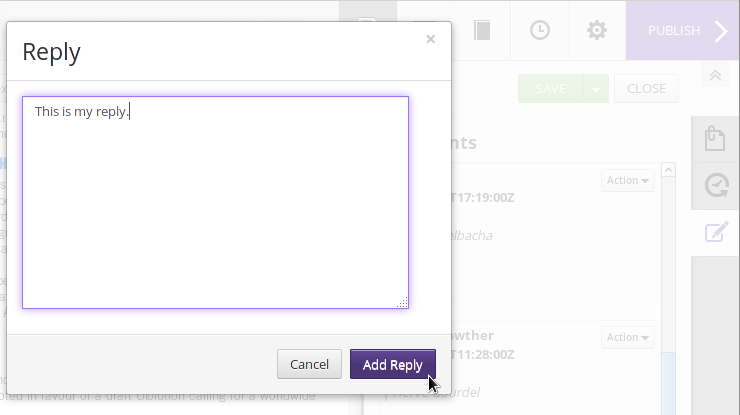 Choosing Reply from the drop-down menu opens a pop-up window for you to type the reply into. Non-breaking spaces imported from Word are shown by the ° symbol, which is a non-printing character in the output. It is also possible to insert a non-breaking space in Booktype. For example, you can insert a non-breaking space between the final two words of a long subhead to put those two words on a line of their own. First, position your cursor where you wish the non-breaking space to be, then click the Insert non-breaking space button in the edit toolbar, which has a U-shaped magnet icon. If you select one or more spaces with the cursor before clicking the button, this action will not remove or replace an ordinary space, but will insert the non-breaking space at the beginning of the selection. To remove a non-breaking space, position your cursor just after the symbol. The non-breaking space button will be active, with a dark background. Click this button again to turn the symbol into an ordinary space. In chapters concerning Viet Nam which contain people and place names, there may be display issues with certain characters. The Vietnamese language uses French typography, but combines accents on the same letter in order to produce special characters with different vocal sounds. These special characters are not supported in many fonts. If a rectangle character appears after a special Vietnamese character in PDF output, the ordinary space can be replaced with a non-breaking space to work around the issue.